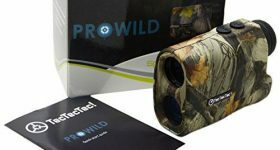 At first look, the most critical selling point of this model seems to be the price tag, seeing how this manufacturer manages to offer a rangefinder that doesn’t ask you to break the bank while, at the same time, offers pretty decent performance. This model will not only manage to calculate the distance between you and your target, but it will also take speed measurements, something that any hunter can appreciate as being a pretty useful feature. Featuring a magnification power of 6x, this rangefinder is pretty standard and on par with models that are even more expensive. The 24mm objective lens is adequate to pursue wild animals when hunting, and it serves to keep the size of the model compact and easy to carry around. The measuring system is very useful and delivers results in both yards and meters for maximum convenience. Using a line of sight for calculating distances, it doesn’t have any slope compensation features, and it might not be a good option for a golfer. However, for a hunter, especially seeing how decently it is priced, it is an ideal pick. You can’t go wrong with a product that offers such great functionalities in a compact body. First of all, the range of the unit is 540 yards, and, while it might not deliver incredible results at distances under 50 yards, its capabilities can go as low as 10 yards. You won’t have to worry about accuracy, either, as the model has a maximum error of one yard, so you get a clear idea what the distance is between you and your target. Using the scan mode is convenient, as well. Also, because the model comes with advanced speed technology, that means that you will have all your measurements updated on the go, and you will also know how fast your target moves. Experienced hunters can tell you that such data is invaluable and can make or break the success of a hunting trip. The multilayered optics are of good quality and contribute to making this particular unit an option for a hunter who doesn’t want to spend a lot of money on an expensive rangefinder. On the display, you will be able to read the distance between you and your target, and you will also notice the battery meter that is right in front of your eyes so that you know when you have to replace it. The continuous measurement mode provides fast results, and that’s what matters most. Don’t expect this unit to be waterproof, but bear in mind that it is water resistant so a few splashes of water will not damage its components. At the same time, it is fog proof, which means that its performance will not be that badly influenced by weather. However, just like any other laser rangefinder, heavy rain or fog will disturb the ray path, and that is when you might start to get some inaccurate readings. It is also durable and resistant to dust, and you’ll appreciate the fact that it is lightweight and easy to carry around. Hunters will surely have a blast with this one. Unlike other models that don’t include a battery, this one comes with an included CR2 battery, allowing you to start using the rangefinder as soon as it is delivered to your door. You will also like the fact that a wrist strap is included so that you can leave the rangefinder to hang on your arm while you free your hands for other tasks. The good news is that you will receive a carrying pouch for easy transportation, a cleaning cloth for the lens made from microfiber, along with a quick start guide. Customers get a one-year warranty with their purchases, as well. 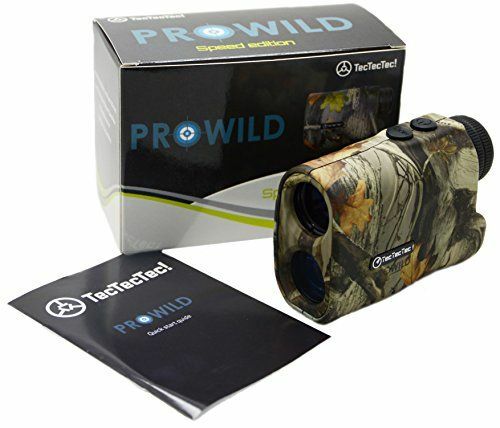 You might not find fancy functionalities on this model such as slope compensation or a flag lock mode, but you will get everything you want and expect in a laser rangefinder that is geared directly toward hunting. Instead of trying to do multiple things, without doing one right, this model focuses on the task of giving you accurate and fast measurements when hunting and does it well. Seeing how it is sold with multiple extras, it is quite a good deal, given the attractive price. For increasing your accuracy as a shooter, the date provided by this unit is handy.